BORN: 1836 in Spartanburg, SC. DIED: 1896 in New York City, NY. Pierce Manning Butler Young was born in Spartanburg, South Carolina, on November 15, 1836. His family moved to Cartersville, Georgia in 1839. At the age of 15, Young entered the Georgia Military Academy, from which he won an appointment to the US Military Academy at West Point. As a West Point cadet, he was known for his gracious courtliness, personal charm and intense loyalty to the South. Thus, when the Confederacy was organizing, Young resigned from West Point, only three months before graduation. Young was commissioned a lieutenant of the Georgia militia, but soon entered the Confederate Regular Army. He served under Brig. Gen. Braxton Bragg at Pensacola, Florida for several weeks, after which he went to Richmond, Virginia. In Richmond, he became adjutant of Cobb's Legion, and soon was made a major in the legion's cavalry. Young became ill, but eventually recovered and returned to active combat. Earning a reputation as a strong officer in Brig. Gen. Wade Hampton's cavalry brigade, he was wounded in 1862 at Burkittsville, Maryland and near Middletown. The wound he sustained near Middletown was a chest wound In June of 1863, he led the right advance of Hampton's command at the second Battle at Brandy Station. He also fought in the Gettysburg Campaign, most notably at Hunterstown, Pennsylvania in July of 1863. Wounded south of the Rappahannock River, he took time off for recuperation. After his recovery, he was assigned to the cavalry brigade, and was named brigadier general to rank from September 28, 1863. In 1864, he was wounded again, in the chest, at Ashland, Virginia. He returned to duty and joined the Hampton-Rosser Cattle Raid. Two months later, Young went to Georgia to secure remounts, recruit troops and help defend Augusta and Savannah from Maj. Gen. William T. Sherman's forces. 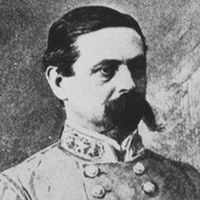 By the end of the Civil War, Young was a major general and division leader under Hampton, fighting in the Carolinas Campaign. After the war, he returned to Georgia, and lived as a planter. He was elected to the US House of Representatives for four terms (1868-1875), served as consul-general at St. Petersburg, Russia (1885-87) and was US minister to Guatemala and Honduras (1893-1896). Young died on July 6, 1896, in New York City.